Can Investors Count on BMW's Fat 5.6% Dividend Yield? BMW's stock has slumped, making its dividend yield tempting. But is it a good bet? Auto stocks have been under pressure over the last year. After several years of sales growth, new-vehicle sales are showing signs of slowing down. Because autos are cyclical stocks, with profits that rise and fall with economic cycles, investors are concerned: Will profit growth be scarce for a while? For long-term-minded investors, that pressure has created some opportunities. A well-run automaker that pays a solid dividend could be a worthwhile buy at current low valuations. If you reinvest that dividend through the next recession while the stock price is low, you might be quite pleased with your return when the stock jumps during the next recovery. German luxury-vehicle maker BMW -- formally known as Bayerische Motoren Werke AG (NASDAQOTH:BMWYY) (NASDAQOTH:BAMXF) -- was an investor favorite earlier in the decade. BMW's veteran management team, good margins, and early investments in electric-vehicle drivetrains and other advanced technologies seemed to have it in a strong position. There have been some bumps along the way, but that's all largely still true -- and BMW's 5.6% dividend yield seems awfully tempting. But if we're considering an investment at this point in the cycle, we want to be able to count on that dividend. Can we? BMW's headquarters in Munich, Germany. Image source: BMW AG. BMW's dividend yield is quite high at 5.6%. Any time we see a dividend yield over 3%, we need to dig deeper: Is the yield high because the stock has been sold off -- a potential sign of deeper troubles at the company? And is that high dividend sustainable? A high dividend yield suggests that BMW's stock is selling at a low valuation. Sometimes, stocks trade at low valuations because their industries are out of favor -- and we know that autos are somewhat out of favor right now. But sometimes, a stock is cheap for good reasons -- reasons that have led clued-in investors to steer clear. The quick way to sanity-check a low valuation is to look at how it compares with other companies in its peer group. Right now, BMW is trading at about 5.8 times its earnings over the last 12 months: How does that compare with other global automakers? Data source: Thomson Reuters. *The calculation for General Motors excludes one-time items, notably a very large non-cash charge that GM took in the fourth quarter of 2017 related to tax-law changes in the United States. With one-time charges included, GM's price-to-earnings ratio is about 68. Obviously, BMW isn't undervalued compared to its peer group. On the contrary, BMW is trading at a very slight premium to the company that's probably its closest rival, Mercedes-Benz's corporate parent Daimler. But it's well within the range we'd expect after looking at other automakers. Clearly, BMW's low valuation isn't a special case. Its stock price has fallen about 20% over the last year, but again, that's in line with the declines we've seen at most of its rivals. BMWYY data by YCharts. 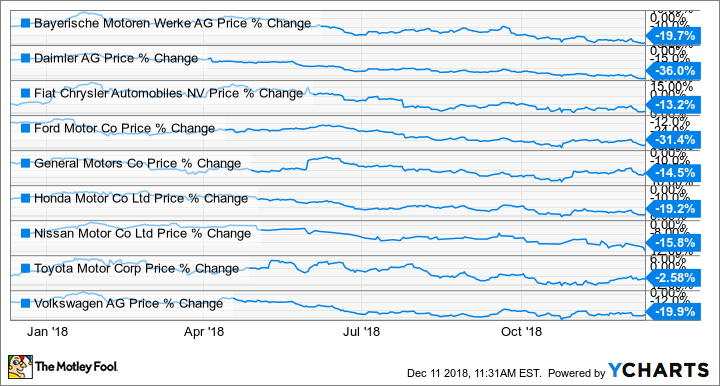 Share-price changes are shown for the year ended December 11, 2018. The truth is, BMW is executing pretty well given where we are in the economic cycle. It did cut its full-year guidance in September -- but that followed similar cuts at Daimler, Ford, and GM, among others. The company's profits have fallen recently, but it's ramping up spending in future products and advanced technologies, which are important for longer-term growth. But given where we are in the economic cycle, we have to ask a second question: Can BMW sustain its dividend payments through a recession? It's possible that BMW will choose to cut its dividend if and when its profits are squeezed during a recession. The company has boosted its dividend in every year since the trough of the last recession, in 2009, when it paid just 0.30 for the full year. It's possible that BMW will try to hold its dividend at current levels. BMW's payout ratio -- its spending on dividends as a percentage of its net income -- is 30.2%, a reasonable level. And like the leadership teams at most of its global rivals, BMW's management has learned an important lesson from the 2008-2009 economic crisis, when the (few) automakers that had been able to maintain spending on future products through the cycle were able to rack up big market-share gains in the early stages of the recovery. BMW, like most rivals, now maintains a hefty cash reserve intended to keep its future-product programs funded if and when its profits are squeezed in a downturn. As of Sep. 30, BMW had 17.7 billion euros ($20.1 billion) in cash, more than enough to see it through a typical moderate recession. Some automakers, including Ford and GM, have said that they also will use their cash reserves to continue paying their regular dividends through a recession. It's not clear whether BMW will do the same, but it almost certainly could -- unless the next downturn is severe and protracted by historical standards. The upshot: Can we count on BMW's dividend? Simply put, BMW is a healthy, well-run company dealing with difficult external factors that also have affected its peers. BMW appears to be well-prepared to weather a recession, and it appears that it could continue paying its dividend at current levels through the cycle. No company's dividend is 100% guaranteed, but BMW's looks pretty safe. Bolt Production Can Rival Tesla's Model S, but Will It Need to?